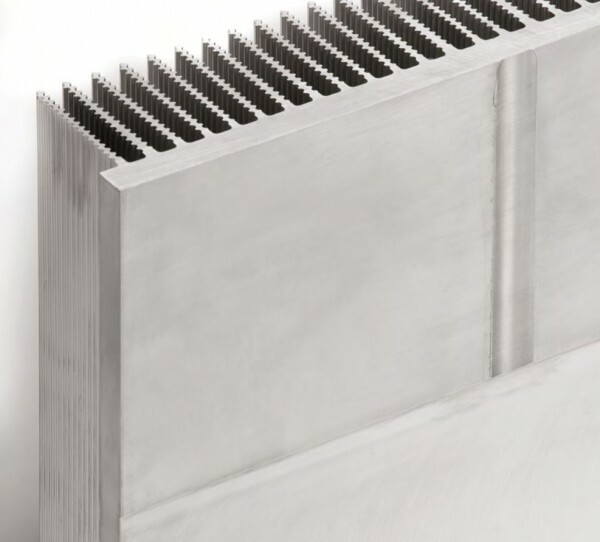 Product information "Welded Heat Sinks"
By joining two or more extruded standard profiles by friction stir welding, robust, stable finned heat sinks with widths of up to 1000 mm can be produced. This manufacturing process can be very flexibly adapted to custom dimensional requirements and can be used for many modifications to standard extruded profiles. While friction stir welding has the advantage that no additional welding material is required, we can also provide special profiles that are pre-bevelled during production and which thus allow an efficient TIG or MIG welding process. Please contact us for detailed information on the selection of profiles that can be joined together through welding process. Related links to "Welded Heat Sinks"
Customer evaluation for "Welded Heat Sinks"